On the 19th of March, the Metal community lost one of the most gifted musicians to emerge from Sweden during the formative years of the Black and Death Metal scene of the early '90s. David Parland's musical legacy cannot be denied. He was responsible for the creation of both Necrophobic and Dark Funeral, among other bands. Though each has gone on their own paths since parting ways with him, it is safe to say that neither band would exist today without the impressive foundation laid down by this man. For that, members and fans of both bands owe this man a debt of gratitude. Like many teens in the 1980s, David took an early interest in Metal, starting with traditional bands but soon gravitating toward the more extreme side of things. With a passion for the likes of Bathory, Slayer and Morbid Angel, he picked up the guitar and taught himself how to play. Already in high school, he formed his first bands. Eventually, with Joakim Sterner and Stefan Zander, Necrophobic was formed. One could tell, even from the Slow Asphyxiation demo that this band had something that most of their peers were lacking. By the time they released their first full-length, The Nocturnal Silence, it was clear that Necrophobic had something very special. Much of this should be attributed to David's songwriting brilliance. It was his sense of melody and his way of conveying the darkness that he felt in this world that made those songs what they are. With so much creativity within him, David was not content to just play Satanic Death Metal. Soon after, he joined with Ahriman and formed one of Sweden's best-known Black Metal bands, Dark Funeral. With the self-titled E.P. and The Secrets of the Black Arts, he created enough momentum that this band is still going today, despite the severe decline in quality since his departure. 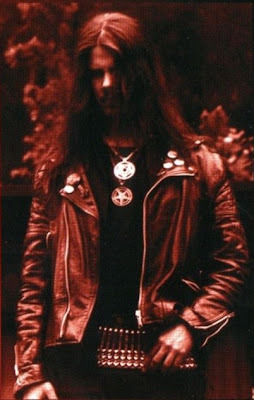 Within a short time, he had left both bands, even though he'd written the majority of the material for Necrophobic's sophomore effort, Darkside. The reason cited was that there were personal differences. Anyone that has ever made music with David will say that he can be difficult to work with, at times. I know this from our time working on a project a couple years ago. The thing that people may not realize is that he was a perfectionist. He had a true artistic vision and could not accept anything less than 100% effort from those around him because that is what he gave, himself. Music was not a casual hobby for him. It was the greatest passion of his life. This was quite evident when he spoke of his intentions for Infernal. Though the band only released a few extended plays, he was determined to put together a full-length album. The truth is, he could have done so years ago, but he did not feel that all of the ingredients were right. If the line-up or the material did not completely meet his expectations, there was no way that he would release an album just for the sake of doing so. He believed in quality over quantity. Anyone familiar with his work should already know this. And, really, his musical career is well-documented and there is little than I can say that would be news for anyone. But I would like to speak a little about David Parland, as a human. David and I met during, what can be considered, the darkest periods of each our lives. The first time that I spoke to him, it was the typical sort of contact that one would expect, merely expressing my gratitude for the music that he had created and how important it had been for me. He soon saw my website, initially to see what had been written of his bands, then reading much more and complimenting my work. After some time, our conversations went beyond music. We discussed the various trials and tribulations of existing in this world. Each of us were at very low points and struggling just to remain alive, trying to cope with unbelievable amounts of misery and solitude, enduring great pain (mental and physical) as well. Through this darkness, we bonded and became as brothers, each finally finding someone with which to share every single thought, not worried about being misunderstood or criticized. Even if we were just feeling completely hopeless or frustrated with every aspect of life, we could rant to one another and find some compassion and even encouragement to continue on. Many nights, we would practically write short novels to one another, back and forth, for hours on end. Due to nerve damage, I could not always write for a long time without suffering in agony, so I began making voice recordings from time to time, in place of emails. He responded by making videos with his phone, talking to me for an hour or two at a time. For a long while, this was the most human interaction either of us had. Anyone that has been in a similar situation can probably understand how important it is to find someone that truly understands and can empathize with you. To encounter someone that sees the world in a very similar way and thinks and feels the same, as well as experiencing the same kind of problems... there was something very comforting in this. No matter how many people abandoned or mistreated us in our time of need, we were always able to reach out to one another and know that we could find some sort of understanding and friendship, even if we were on opposite sides of the ocean. There were several times when I was ready to give up on life, and David was there for me as a true friend. He didn't hesitate to make an international call and cost himself $200 to speak to me and make sure that I was alright and stable enough to not do anything dangerous. Though we each talked and thought of death a lot, we would often try to give encouraging words to the other. There were also times when I had nowhere to stay and no money for food, and he sold off some musical equipment to get money to wire to me, so that I could get a room for a few nights or to feed myself. He really was like an older brother, looking out for me. I tried to do the same and return the favour whenever I was able, later getting and sending him one of the pieces of equipment that he had earlier sacrificed for me. The truth is, I could never repay him for what his friendship has meant to me over the past five years or so. The last time I visited him was this past November. The tone of our typically sombre messages changed drastically, the moment that I told him that I was on my way. He was more excited than I had seen him, probably ever. During my few weeks there, we managed to hang out about every other night. There wasn't a whole lot to do, and we were both in too much pain to get out to the forest or cemeteries and walk around for too long. Still, we managed to visit various pubs and coffee shops and to spend countless hours talking and actually sharing some laughs. He had a great sense of humour and when he smiled his eyes seemed two decades younger. He spoke fondly of the past, his deeper involvement in the music scene some years earlier, rehearsing with his bands, playing live and so on. Similarly, his face would light up when he began talking about his plans for Infernal, how he wanted to get his life back on track and focus on his music, as well as the Bathory tribute album that he had been pouring so much time and effort into. He was so lively and seemed more awake than ever before. Even though it was often tough to get him motivated to get up and get out, once I did, I think it was really good for him. One night, we ran into some members of a local band and ended up going back to their rehearsal space for some hours, though they had no idea who David was. As we were talking about music, one of them mentioned Necrophobic and I pointed out that they were sitting in the same room with the man that created that band. He was too modest to bother speaking up first and telling people of his accomplishments. But once they found out, they were asking him questions and he was smiling and sharing more stories. At one point, someone handed him a guitar and he began playing various songs, from old Bathory and Slayer to Necrophobic and Infernal. For us, a couple of bitter misanthropes to be socializing with strangers and having a nice time, this was unexpected for each of us. And yet it was a really great night that extended until about 5am. It showed that were were both capable of functioning a little better, if only life would cut us a break once in a while. Not long after this, my depression reared its ugly head again, partially because I knew that I would not be able to remain there in a place where I actually had some purpose and friendship, and would have to return to an existence of absolute nothingness. David was the only one to see the warning signs and was texting me constantly, to check on me. When he was unable to reach me for some hours (due to me not having credits on the phone), he got very worried and was calling every place that we regularly visited to see if I was there. He even called the police, trying to see if they had any information, as he suspected the worst. When we finally met up, he was very much shaken and I could tell how stressed he had been, not being able to contact me after my extremely negative message. The following week, the pain and hopelessness got to be too much for me and I ended up attempting to end my life anyway. David Parland was the only person that was there for me and the only one that cared. He knew exactly what I was feeling and understood completely, yet he still didn't want to see his friend die. Even in recent months, as we bother continued to get hit with one more terrible thing after another, we remained in contact and tried to be supportive in whatever way possible. Being on another continent and unable to return to Sweden as soon as I'd have liked, I made attempts to contact various acquaintances and ex-bandmates of his to let them know that he was in bad shape and urging them to reach out to him and to help. Most of those messages were ignored, while some of the replies that I received were nothing but apathetic. I can't help but feel bitter toward those that knew him longer and were actually close by, yet did nothing. That certainly wasn't the kind of half-hearted friendship that he deserved. I've often said that when people look at someone in need and say that they "wish they could help", that the truth is that they would only do so if it was 100% convenient and required no sacrifice on their part. David understood what real friendship was. He didn't turn his back on those in need, as most people do. I want to extend my most genuine gratitude toward those few people that truly offered him friendship and support in his final days. David Parland was the kind of man that, while he was opinionated and tough to work with sometimes, he would do anything in his power for those that he cared about. He may have been misanthropic toward the masses, in general, but he was fully capable of caring for people on an individual basis. He was even forgiving to those that caused him massive grief and, maybe, didn't deserve his forgiveness. A lot of people know him for his musical contributions and, it is true, he has left behind a legacy that will never be forgotten. Many will mourn him only as someone they looked up to or because he's no longer around to record more music for them to appreciate. But those of us that knew him on a deeper level, we know that he was more than just a brilliant songwriter. He was an intelligent, thoughtful, funny, generous, kind and understanding man that suffered far too much in this rotten world and has gone far too early. He often said that he would not live to an old age, but that he at least wanted a few good years; to record and release one more album with Infernal and to find love and settle down for a while. Though his final days were incredibly difficult, it seemed that some of these things were beginning to fall into place. He deserved a chance at a peaceful life. He's now lost that. And I have lost more than a friend. I've lost a brother. The world is a colder and darker place without him. He will be forever missed. Let us honour his memory, always.